Their shoulders are swinging softly, their feet are tapping on the stone floor and some of them are shutting their eyes in intense passion. 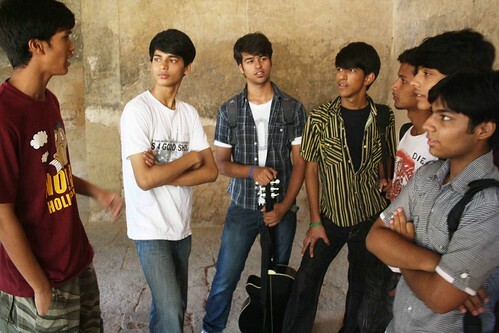 This is a group of seven – Mohammed Shamim, Amit Sharma, Prateek Malik, Riaz Ahmad, Nipun Sharma, Yash Saini and Shanky Goel. 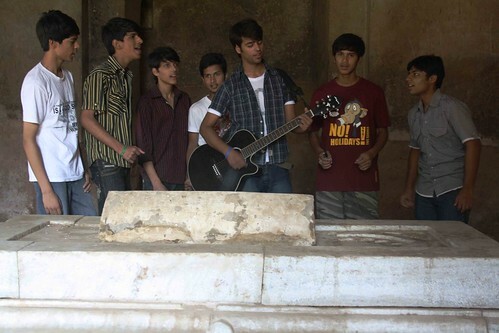 The boys are singing in a hush as if not to disturb the ghost of Feroze Shah Tughlaq, the 14th century ruler who is buried in the tomb, around which they are standing. 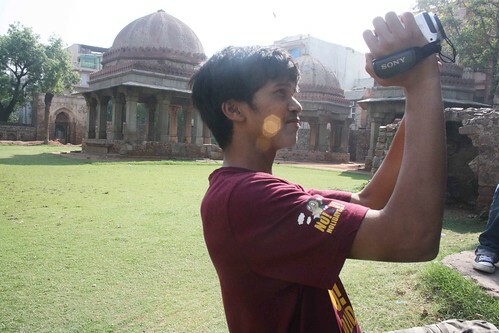 The Delhi Walla is in Hauz Khas, the monument complex in south Delhi. The boys are students of XIIth standard in the nearby General Raj’s School. They are shooting a documentary, a part of their classroom project. Amit and Nipun are the group’s problem boys. They are the regular latecomers. Nipun is also known for frequently squabbling with Shanky. Inevitably Riaz, the sober one, ends up as the peacemaker. He shares a strong bond with Shamim and Prateek. “We have formed a love triangle,” Prateek says with a laugh. 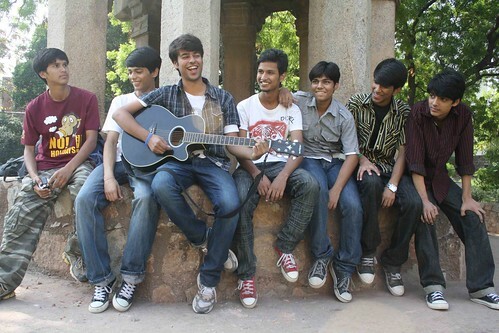 In the documentary, Prateek plays the rock band’s lead guitarist. Shanky is the second guitarist. 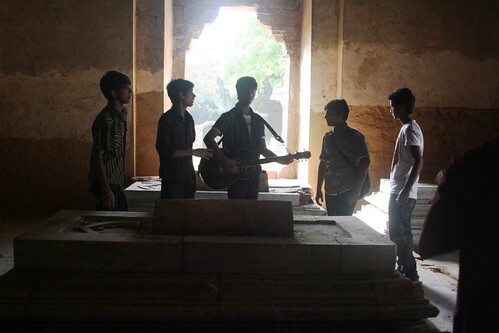 Nipun sits on the keyboard; Yash is the drummer. 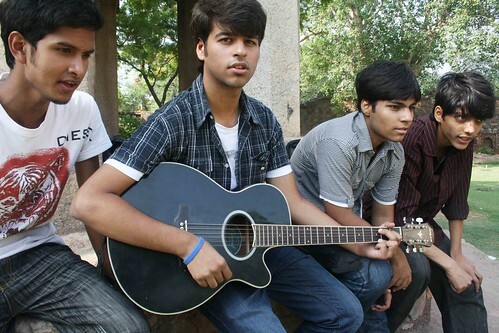 Riaz and Amit are vocalists. Shamim is the only non-actor. He is filming the documentary with his Sony digicam. “My work is challenging,” he says. “You have to capture the mood shots of the actors from the right angle. I want them to convey their feelings in a very natural way.” The documentary has no director. Everyone give their inputs. There is also no script. Neither are there any women. “We have girls in our group but their parents didn’t allow them to appear in the film,” says Riaz. The girls would have been a distraction. “We are a band of brothers,” says Amit. While on the job, the boys good-naturedly scream Hindi swear words at each other. The characters in the documentary are not good in academics, but they connect with each other through music. 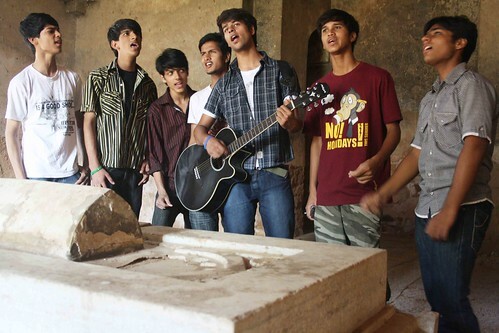 They decide to show the world their extraordinary talent by forming a band. 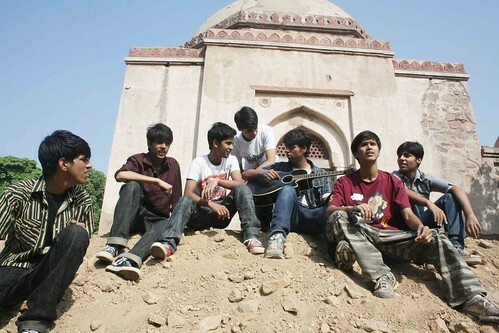 The documentary involves scenes, which show them practicing in different parts of Delhi. 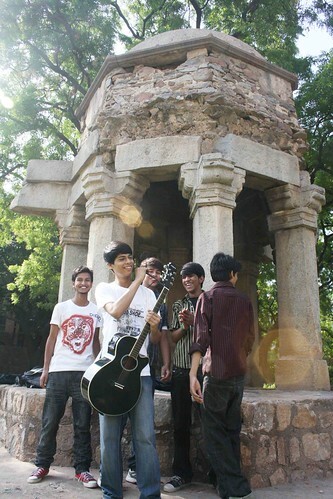 Hauz Khas ruins are one. An hour ago the boys had an argument. The characters had to be shot in a depressed mood. Cameraman Shamim wanted a forest background so they went to a secluded spot in Deer Park that overlooks Hauz Khas. Amit, Prateek and Yash objected to the site. “It was too much of a jungle. When you are feeling low, you don’t go to such a wild place,” says Amit.